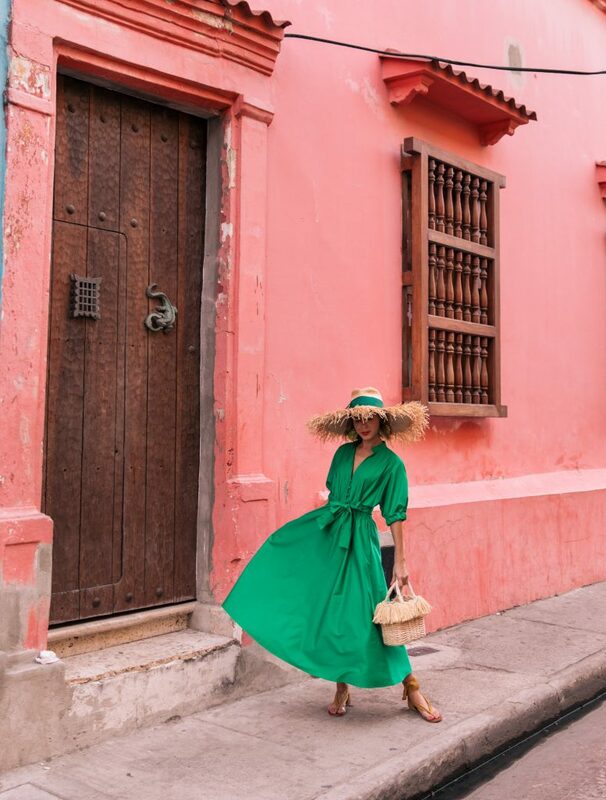 Today on The Style Bungalow, I’m sharing a few of my favorite moments from Cartagena (in case you missed them on Instagram) and links to shop each outfit + a few travel tips for shooting in the city from yours truly! 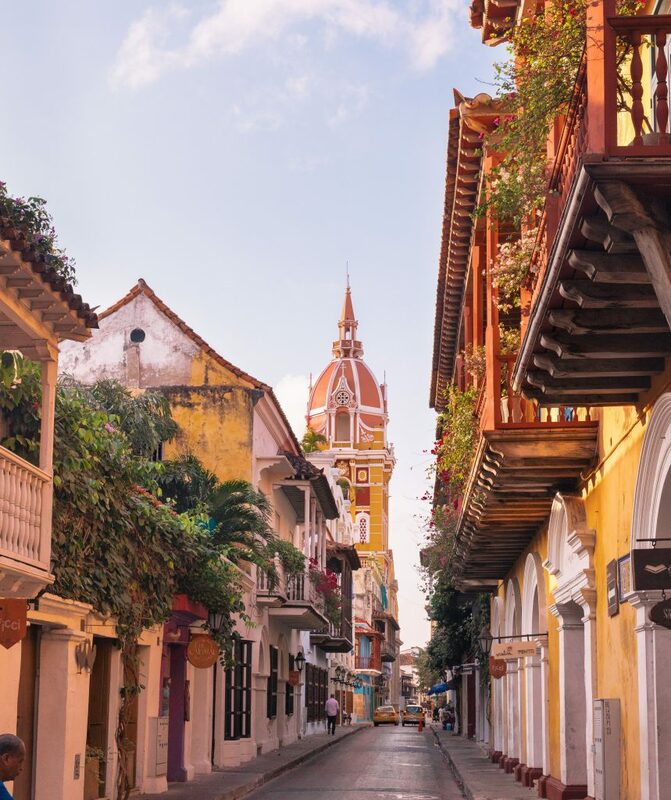 When you think of Cartagena, you think of the famous Fruit Basket Ladies! 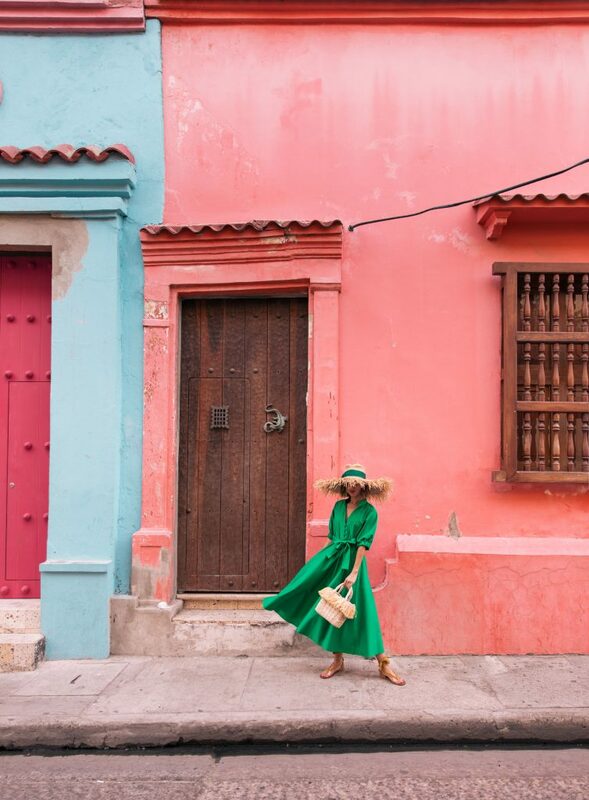 Just head over to the Plaza Santo Domingo and you’ll find them walking around. They’re like celebrities! To take a picture, buy fruit or tip them pesos (a few USD dollars). Around sunset, they start to leave the city. Many times, walking side by side which is how we captured this moment! It was very impromptu – and yes, we tipped each fruit lady and loved having their beautiful smiles in the background! 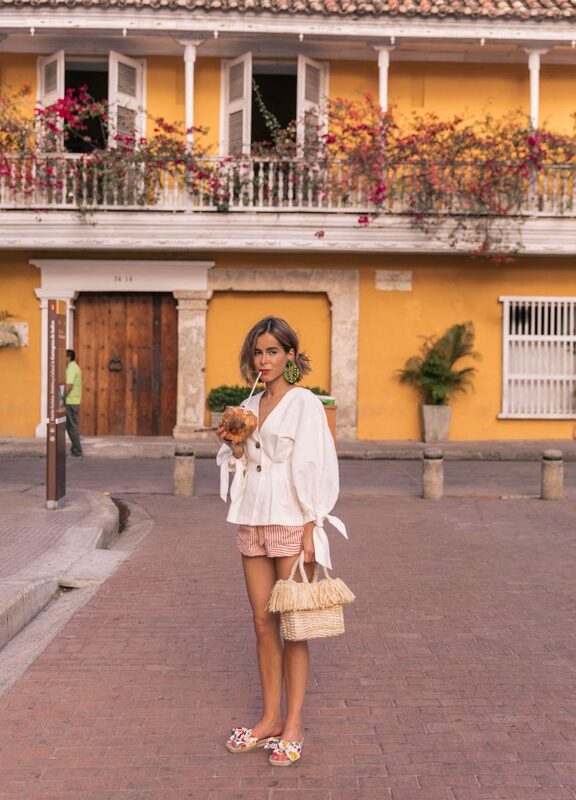 I wish I pinged the location of this pink wall in Cartagena but I totally forgot to. 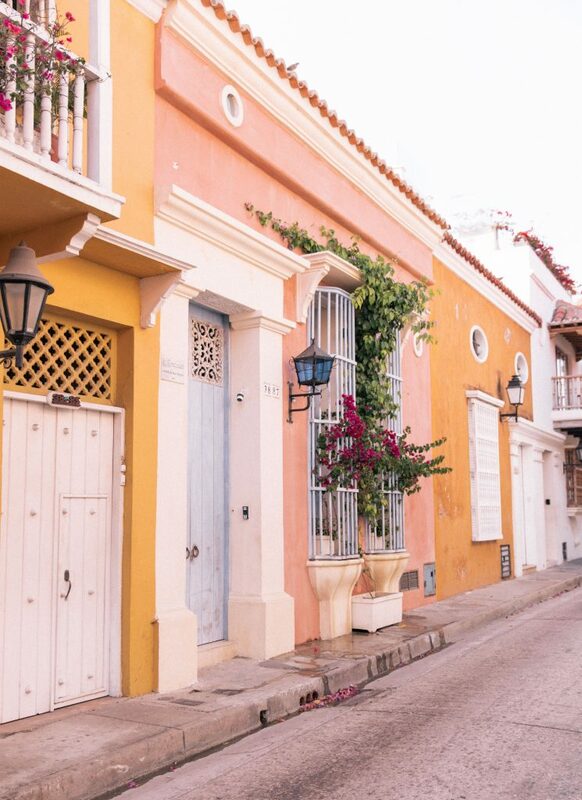 Fortunately, there are plenty of colorful streets lined with all sorts of colors. Purples. Pinks. Oranges. Yellows. Each one had texture and the right amount of saturation that only years of deterioration can do. PHOTO TIP: If you’re a blogger or a visitor, wake up super early to take your pictures! Like, be there by sunrise. Although the light during the day is “workable” because of shade from nearby buildings, the city was bustling with people walking up and down the sidewalks making it next to impossible to get a shot without a person in the background. Everyone went crazy over this dress and rightfully so! It’s from Zara and I’m not sure it’s still available online anymore. (I bought this one at the Brickell City Center Zara in Miami). It’s funny, I bought it one size up because they didn’t have any more dresses in my size (I typically wear an XS). My boyfriend saw me try it on and loved it! He said it was so me… whatever that means! 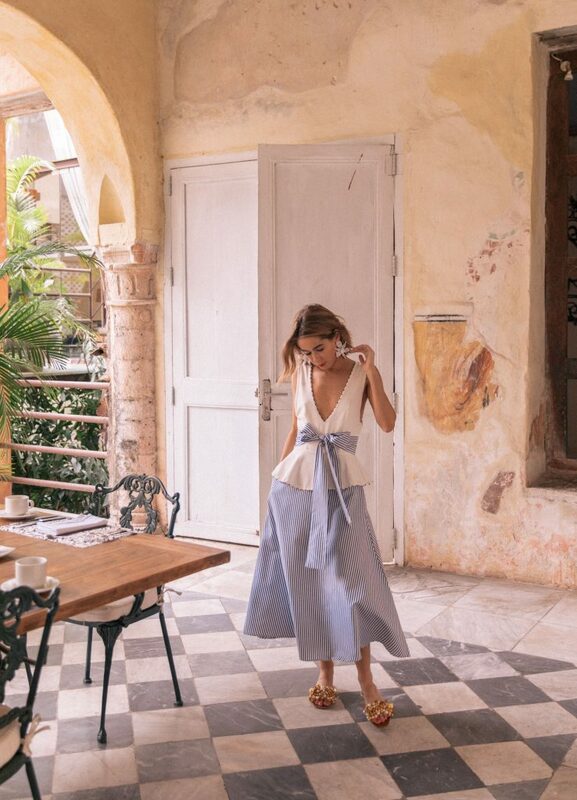 I suggest browsing Shopbop for more midi dress options here. Shopbop continues to be one of my favorite, favorite destinations for contemporary designers. Plus, I know (for a fact) the quality will be worth it so I have zero problems recommending the e-retailer to my readers. 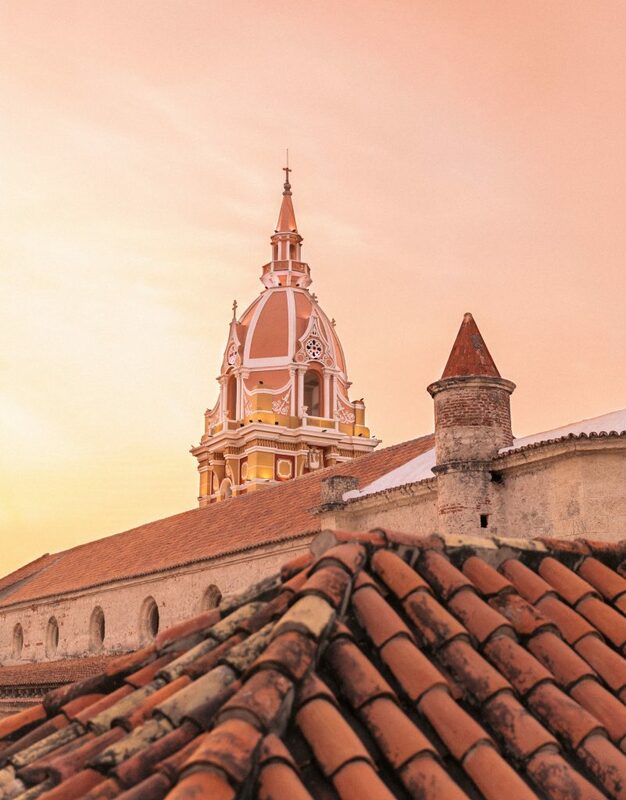 The Cartagena Cathedral was right next to our hotel, Casa Pombo. 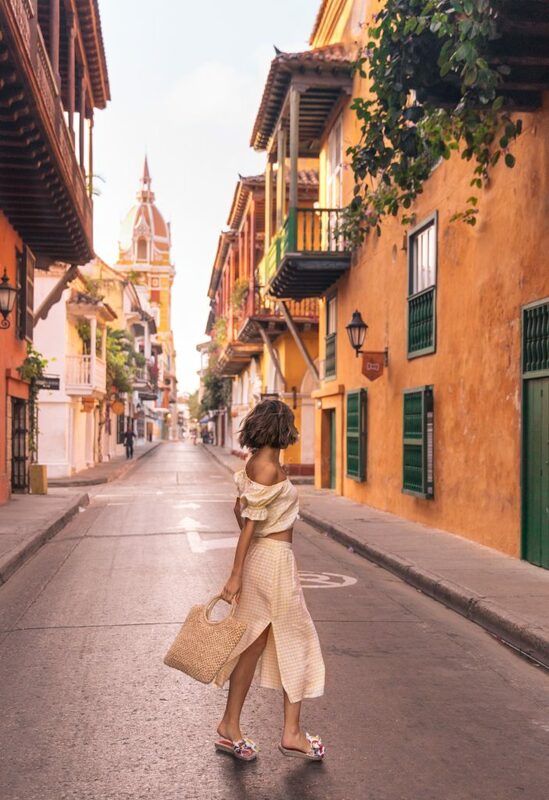 So, every day used the Cathedral to guide us home because the streets in Cartagena are narrow and somewhat confusing to navigate. To get this shot, we woke up early (between 630-730AM) and found a street far enough from the Cathedral to get a good vantage point. To get a closer shot, find a rooftop bar, buy an early drink at the bar and wait until sunrise to get twinkling lights in the background. I mean, it was like I was in fruit cart heaven! 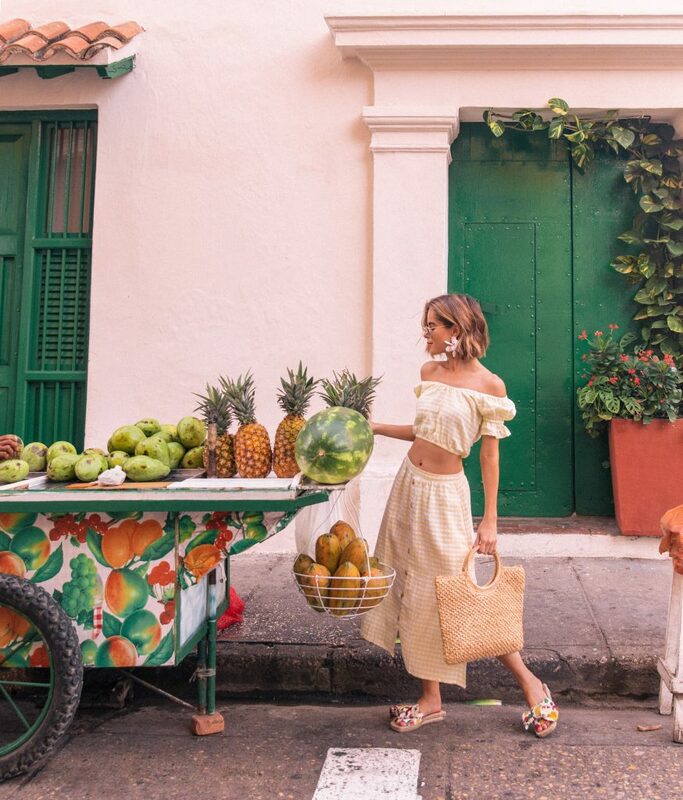 Every block you walked, you found a fruit cart, coconut cart or juice cart. If only you knew what lengths we’ve gone to get similar shots in Palm Beach where these do not exist. I repeat: do NOT exist. So yes, I was quite the happy camper! Again, I did not ping these locations but I assure you there are plenty of options to choose from! Everyone we spoke to was friendly and warm. Living in South Florida, I’ve met plenty of sweet Colombians (including my best friend and boyfriend!) so I was not surprised to see the same in Cartagena. Each person was (#blessthem) patient with my broken Spanish and kind enough to let us shoot with their carts. Just be sure to leave tip or buy a round of orange juice for the group if you decide to do it. You have no idea how far your dollar goes and how much it means to them… they work tirelessly in the hot sun for a few dollars an hour. It definitely put things in perspective for me watching these locals work (and with a smile) for next to nothing. As if I haven’t mentioned Casa Pombo enough on here (and no, this isn’t sponsored). 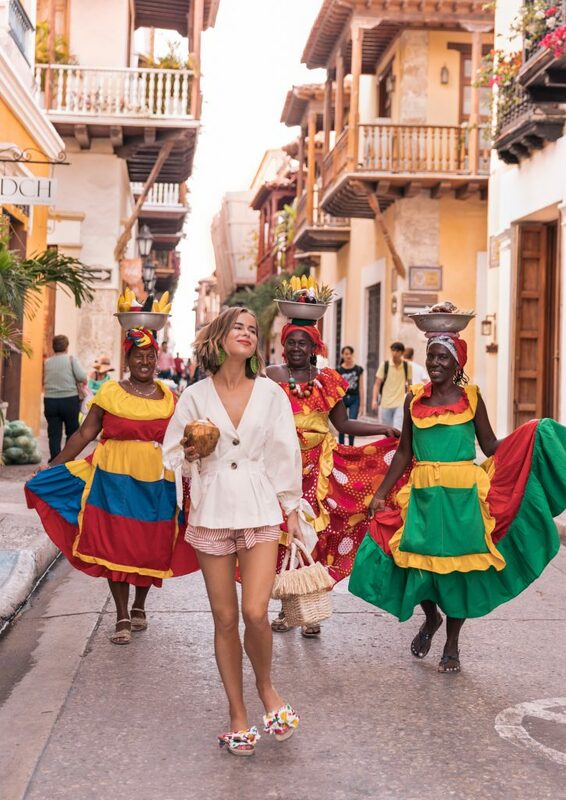 In my opinion, your best bet with Cartagena (if you’re a blogger) is to stay at a hotel. I say this because the hotels are comparable in price to some of the Airbnbs and most of the times, will include breakfast. Plus, you will have access to a pool and friendly staff who will help you navigate through the city. This look was SO last minute! For those asking, my headscarf is from one of the local street vendors. Again, you’ll find plenty of people selling headscarves on the streets so don’t fret. I think this one cost me $10 but you could easily recreate this look at home with a sash or cream turban. That’s it for now! I’m SUPER behind on writing, emails, life, you name it so I’m logging off early and saving Pt. 2 for another day. Let me know if I missed anything! I’m happy to answer your questions! Fun fact: I didn’t like the Zara dress in-store but I love to see you wearing it! How do you edit your photos they are AMAZING!! Thank you! I get this question a lot… I work very closely with a photographer on all my content. We edit each photo individually using Lightroom, VSCO and Snapseed (for iPhone shots). 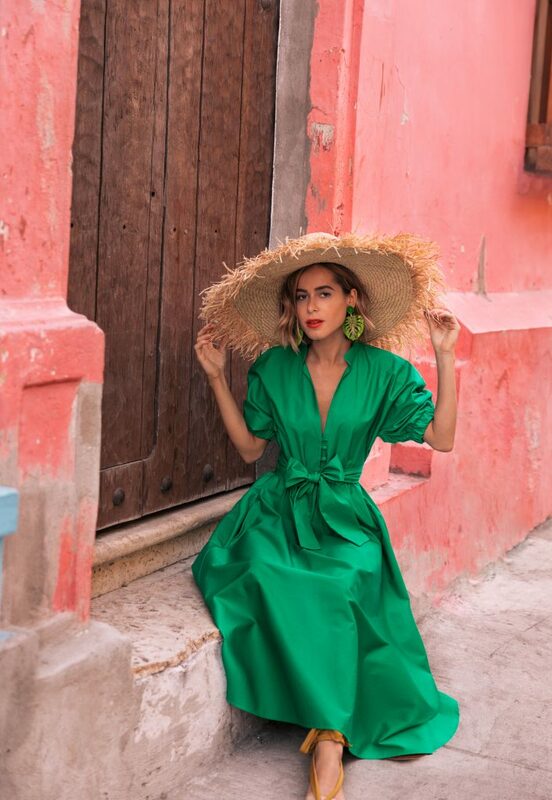 Hi, THANK YOU so much for inspiring me again and not making me feel like a weirdo with my obsession with Travel + Fashion. You do it SO WELL!